We all have had those days when we don’t like how our homes look. Maybe we’re bored or maybe we’re really tired of looking at something we just don’t like. It’s like when you need a new look, but aren’t interested in plastic surgery. So maybe you get a new outfit or change your hair style. It’s nice to have something we can do that’s a quick fix. I know I would really love to lose 10 pounds, but that’s not something I can do in one day. Realistically if you want to revamp your entire house, you probably can’t do that in one day, week month or even year. So what can you do in one day? I think plants do make a space feel happier. The small ones are inexpensive and if you add an ivy or succulent, they are pretty low maintenance. I love having my ivy in my house. Use a cloche to minimize watering. You can add a great, happy color easily with a pillow or throw, or even a vase. Pillows and throws are typically inexpensive also. 3. Remove any old curtains you don’t like any more. If you like them, then you are good! If you don’t like your curtains, then it seems looking at them can really weigh you down. Try removing the curtains, and just living with your blinds or shades for now. Maybe the window doesn’t need curtains. Move things from one room to another one for a new look. I often get a new look by moving things from one room to another. It feels like I made several new purchases, but I didn’t. 5. Set out a tray and fill it with a few of your favorite things. Arranging things on a tray is easy, and it’s fun! It’s like a mini palette to work with. This is a great place for people to start who are nervous about decorating an entire room. The tray acts to corral the items and makes them feel like they all go together. Today’s podcast episode is about why it’s important to know your style and how to figure it out. Love the Blue Checked Cottage Chairs. I have two in my cellar. I am going to reactivate them and elevate them to the living area. Another great idea and pulling my cobwebbed furniture back in operation. 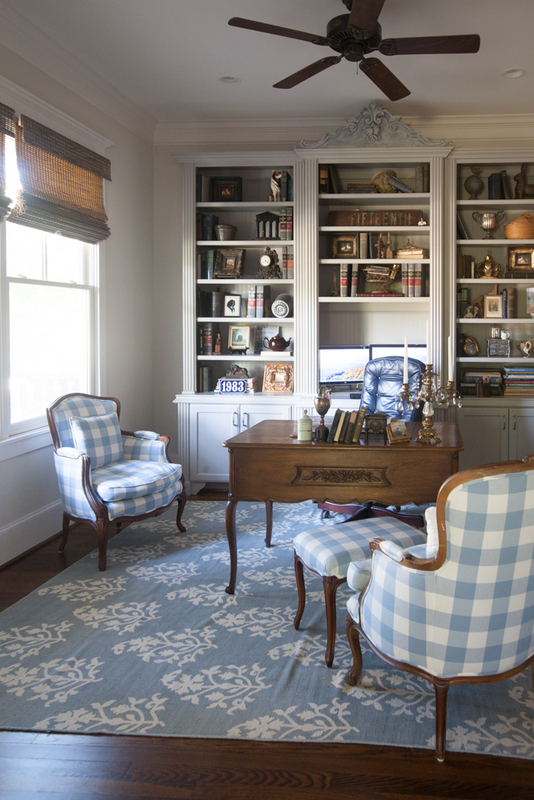 Great tips and I do love the blue checked chairs ! 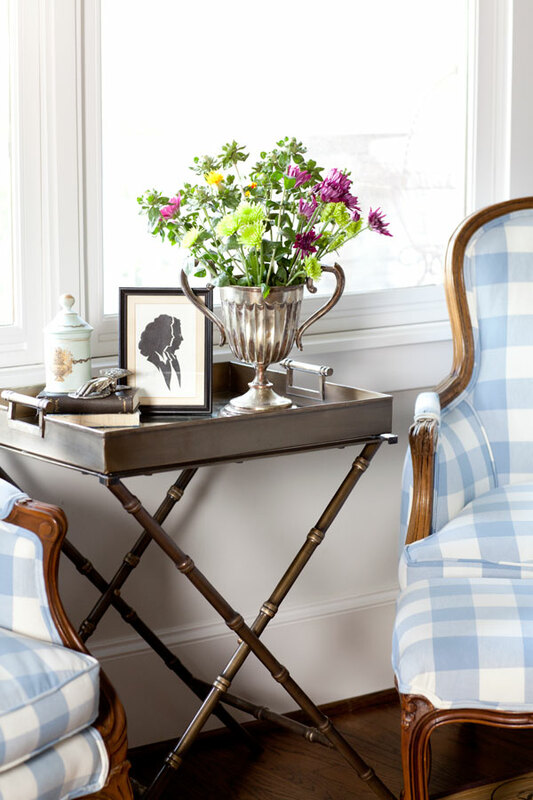 These are some great ideas – my favorites are to pull out d moving a tray and set up a vignette, and shopping your house to move favorites from one room to another! I am loving the podcasts!! Great ideas! Thanks for the pep talk! Love the 5 ideas. Going to have chairs done in smaller blue plaid. OK I just have to ask. 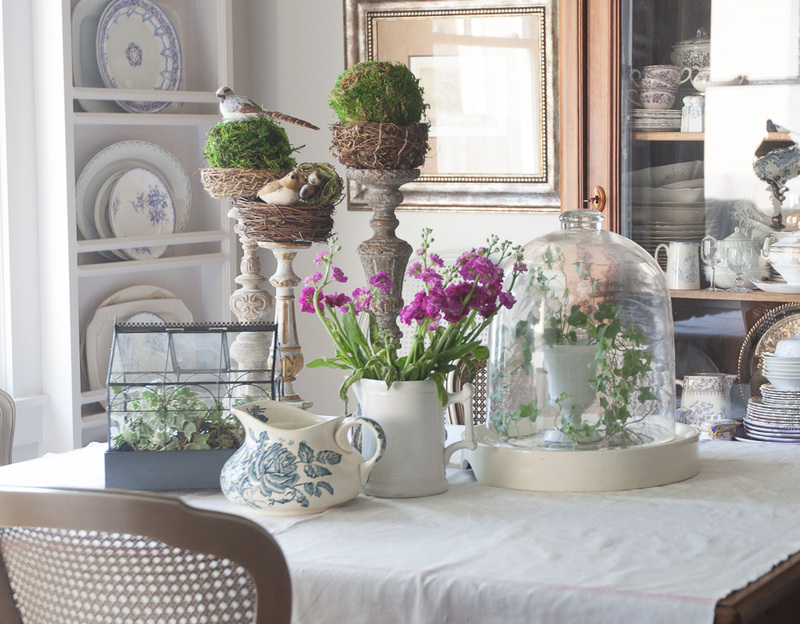 Do you actually USE the dining table when it has a large vignette on it? Appreciate your ideas–love me some mirrors. Have to comment on this wonderful post. 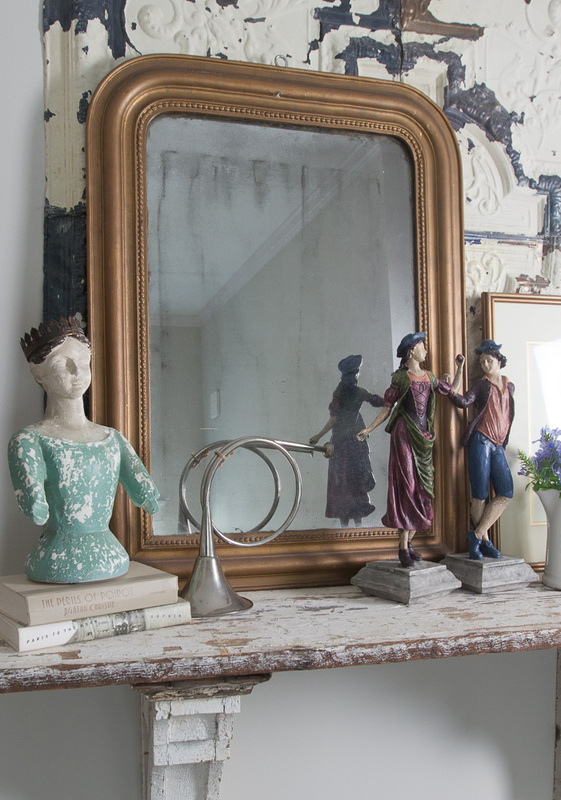 I do my Carousel Rotation to brighten rooms with my treasures. One day a vase will enhance a bedroom and the next week the living room. I call it my Carousel Walk. 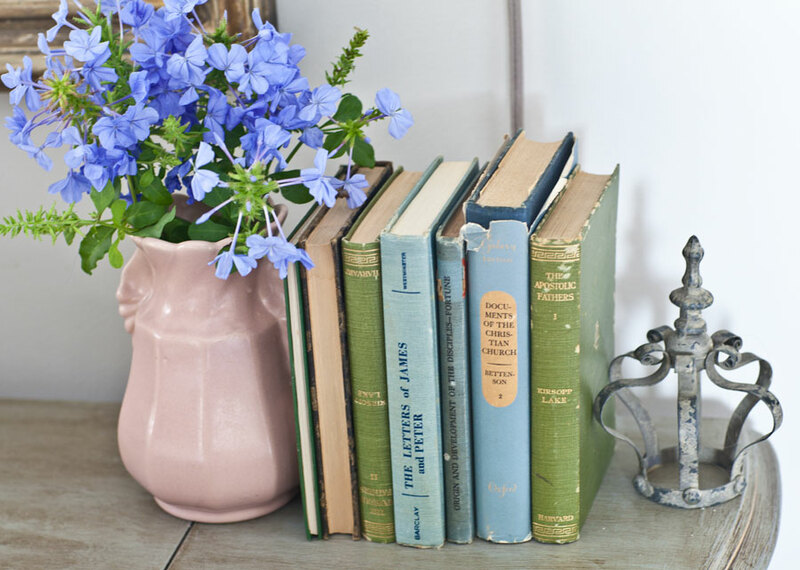 As a Decorating Warrior, my OCD eyes immediately focus on a book or vase and voila’. Here I go again. Love my Village Home. I love just everything you have done. We recently purchased a 1949 home and I am just beginning to learn how to adopt this fresh and clean style. In the vignette on your dining table, I fell in love with the bird nests on your wooden candle pillars. Is it possible for you to tell me where you found them? I have been looking for nests like these and all I can find are tiny, short 3 inch nests. I would love to find some more substantial like the ones you have on display! I would be so appreciative if you can point me in a proper direction. Glenda, I bought them from a wholesaler who doesn’t sell to the public. I had an online shop, but closed it this spring. I am so sorry I really don’t know where you could find them. Maybe at a craft store. The wholesaler was Park Hill, so maybe you could see who carries their products in your area.